In August of 2001 our family set off on a seven day journey to explore the waterways of the Whiteshell Provincial Park. 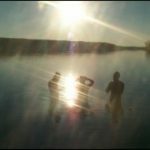 From the staging area at Green Bay Resort at Caddy Lake, the trip covered 181 kilometres through lakes, rivers, rapids and Hydro Dams to the final destination, our home in Pinawa. What follows is a day by day account of our journey as recorded in my journal. We camped last night at Green Bay Resort at Caddy Lake with another group, who will be returning our van to Pinawa for us. It was a nice site with a trail directly to the beach on Caddy Lake. This beach was a very convenient staging area for us. We crossed Caddy Lake in excellent time. Clear skies and a tail wind! The tunnel into South Cross was awesome. We had a long rest in South Cross Lake. We tied the two canoes together and fished and played games. The kids ate pretty much their entire weeks rations of trail snacks. We did some fishing and got lots of nibbles but nothing for our dinner. North Cross tunnel was another great experience. The high water had us ducking as we sped through on the current. The kids were very impressed with the tunnels. Sailing Lake portage turned into our first very tiring, and almost dangerous, navigation error. I have been on this portage many times before but never noticed that there are two trails over the dam – the first one you want to avoid. When we pulled up to the “portage” we noticed a lack of good markers, as well as a lack of the cook shelter I recalled from previous years. We blamed faulty memory cells and proceeded on our first portage. At this time the food pack weighed 70 pounds. The trip was short but when we realized it was the wrong trail, and that a 3 foot waterfall faced us on the other side, we had to double back and paddle over to the correct portage around the corner. This was discouraging. Peter had his first fright of the trip as he realized his parents were actually fallible and we were experiencing a real-life adventure in the wild. Sailing Lake was beautiful, with our tail wind continuing and making us think of constructing a sail, but we were all getting tired. 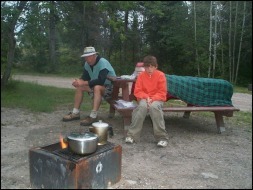 Our plan had been to camp in Mallard Lake, but as we entered the mouth of the Whiteshell River that would take us to Mallard we saw a fire pit and our first home of the trip. We had KD for dinner, spent the evening fishing, swimming and reading and retired around 10 PM. It was too hot for a fire but we lit one briefly to burn foodstuff, taking care to hang the food pack high in a tree, well out of reach of hungry bears. During the night we had a violent thunder and lightening storm with high winds and rain. The thunder was circling around and seemed never to end. We got a little damp in the tent but only because we were too tired and hot to do up the tent flaps. The kids were in their own tents and also got damp from touching the sides of their tent. Expecting the worst, we were pleasantly surprised at how we had faired during the nights storm. Good drainage at the site. Things were damp but food and clothes were dry. Heading to Crowduck today. This was a very tough day! The first big surprise of the day was Mallard Lake. I had been through this lake before in May, but in August this rice lake more resembles a Manitoba wheat field than a lake. We paddled almost the entire length of the lake and it was thick with rice. It was incredibly hard to paddle. We were never sure if we would make it right through or have to get out and push, but we did make it through. I imagine during years where the water is not this high the passing would be even more difficult. By the time we reached the portage around Mallard Falls, the bottom of our canoes were filled with wild rice. We found out later that the temperature that day reached 37 degrees Celsius with a humidex reading of something much higher. It was not clear on our map whether we would have to portage Mallard Falls, but I was missing one portage on my list of nine in total. Sure enough, after battling the rice we reached one very wet muddy portage (0.2 miles) around the Falls. 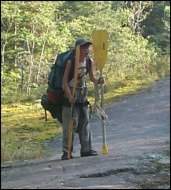 As the food pack was still very heavy, we made two trips on this portage. 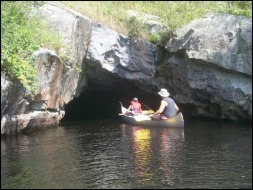 After Mallard Falls we began what seemed an endless long and winding paddle through the Whiteshell River. We needed to find a tributary to the North to take us to Little Whiteshell Lake. If we missed it we would be on the “shortcut” home that would take us through Lone Island, Jessica and White Lakes. We called this the “resort” trip, as there are many resorts and restaurants along this route which would make for a very enjoyable trip. This, of course, was not what we had planned. The group joked about wanting to miss our turn, but I think Peter was the only one who was quite serious about this. 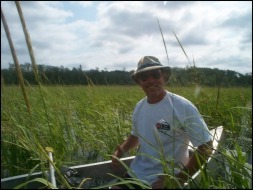 After hours on the rice paddy river we opened to Little Whiteshell Lake. By now we were very hot and very tired and had consumed all of our water. 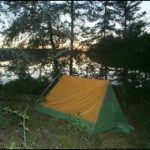 Little Whiteshell was quite shallow and we decided to wait for Big Whiteshell Lake to prepare more drinking water. We were using purification chemicals in our drinking water to avoid the potential of “Beaver Fever”. This turned out to be quite convenient and left no offensive taste to the water. Some boaters (motor that is) told us that there was a store at Big Whiteshell that was quite close to us. Never trust the word “close” when someone has a motor behind them. This news gave us renewed energy as the kids started to think of ice cream and we paddled into Big Whiteshell in record time. We asked directions from a group on a dock and found out that the ice cream would require a 10 mile detour (5 miles each way) and watched the kids faces drop. Needless to say we were in dire need of a rest, a swim, some shade and food. 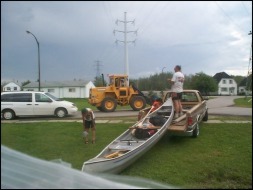 We found exactly what we needed on a big rock out crop in Big Whiteshell and pulled the canoes up. Here we rested in the shade, ate pepperoni, cheese, chocolate and dried fruit and swam in the cool water. We still had a lot of work left before we could rest for the night, but this stop refueled us all. After this rest we proceeded to cross a portion of Big Whiteshell Lake to the portage into Crowduck Lake. Well marked, and familiar to us, we found it without any problems. By now we were working with excellent maps provided us by Barrie Burnett, who not only mapped our route from here on but also marked the mileage, one kilometer at a time! It was great to do the countdown as we paddled. We aced this 0.75 kilometer portage. We took two trips, and ended up so wet with sweat we looked like we’d been swimming, but Rob soloed the canoe without a rest and Peter carried his 45 pound backpack along with paddles and fishing gear, This is a long, steep portage but well maintained and easy to follow. It was at the end of this portage that we met some canoers heading home for the weekend and they gave us their last COLD beer out of their cooler. Rob, Ray and I shared it with relish. They also recommended an island for camping that was quite close and we headed for that. Black Fly Hell Island, as it will be known to us forever now, looked like a great campsite. Flat rocks for swimming, fire pit, clothes line. Large enough for latrine necessities, this island looked like the perfect home, except that the biting black flies (that also seemed to love the bottom of our canoe throughout this day) just wouldn’t go away, no matter what we sprayed or burned. We cooked rice with dried fruit for dinner. It was delicious but we were all to tired to do more than taste it. We swam and washed in the crystal clear Crowduck Lake water. The water here is so clear you can see 10 meters to the bottom of the lake. It reminded us all of our Caribbean vacations, and we wished we’d brought snorkels. It was at this spot that Ray and I noticed a small rip in a screen of our tent. Good thing for duct tape. Day 3 was the best day so far of this trip. We got a late start from our Crowduck camp spot – don’t know why we hung around that fly infested island so long. We had our standard breakfast of porridge, and I had my tin coffee pot of coffee as usual. Our mornings on the trip consisted of long relaxing mornings with coffee, book and journal writing waiting for the kids to wake up – very nice. We were warned than the large open portion of Crowduck that we had to cross could be difficult if any wind was involved. We made it most of the way across with a mild tail wind. By late morning this turned into a head wind, creating waves and difficult paddling, but by this time we had almost finished the crossing. All paddling past the Crowduck portage is new to the entire group, so there are no familiar landmarks to deal with. Navigating into the narrow river that leads to Crowduck Falls proved easy with the maps provided by Barrie and the orienteering skills Rob perfected before the trip. What a difference this river was from the Whiteshell! The water was clear and clean, the banks rocky and scenic. The portage around Crowduck Falls was well marked and short. We carried the two heaviest packs over and then 4-manned each of the canoes, acing this portage quickly. We had a book that told us to “experience an exhilarating slide down the falls” here, and had planned to lunch and slide here. I DON’T THINK SO! Crowduck Falls was a huge rock face with torrents of water spilling over them and certainly suitable only for sliding by the suicidal, and we weren’t there yet. There was also no place for lunch so we put in right away. We met a group of fishermen with Eaglenest emblazoned on their boat and sent a message to friend and owner of Eagle Nest Lodge, Fred Pedruchny. Now someone knew where we were. We later found out he got the message and sent an e-mail back to David Hnatiw who forwarded the news onto other friends – the power of the Internet even out here. We lunched in the boats, pulled up to the shore of the river leaving Crowduck Falls in the shade. Our book told of beautiful camp spots in Eagle Nest Lake with sandy beaches and other amenities, and it was our goal to find one of those. Rob wanted to put on the miles, but as a group we decided to put in for the night at the first nice spot we found. The beauty of Eagle Nest Lake cannot be described. It is a large lake full of islands. The water in this lake was not the same water as Crowduck, but rather looked and felt like the Winnipeg River we have passing by our home in Pinawa. As we came out of the river and into the lake we spotted our first Bald Eagle, and then many, many more before we left that area. Somewhere here we left Manitoba and entered Ontario but didn’t notice until we entered Manitoba again the next day with a sign to welcome us back. Rob was very busy navigating through the many islands in this lake, as we were determined to stick to “Barrie’s line” on our map – not only to avoid getting lost but for the mileage countdown we were enjoying so much. No sandy beach campground came to view as we entered the lake, and in fact we paddled for several hours before we saw any real appropriate camp spot. Just as we were feeling hot, tired and hungry I spotted a picnic table and our home for the night. As opposed to last nights spot, we labelled this spot “Paradise Island”, although we later found out its name was really Strawberry Island. We spilled out of the canoes and directly into the lake for a very long relaxing swim. Large flat rocks made for excellent swimming and bathing. We discovered an echo here, and then later discovered the loons that like to play with that echo. At this spot, while having dinner and fishing, we enjoyed a spectacular sunset on one side of the rock, and a breath-taking moon rise off the other. We dined on Chinesee noodles, beef jerky and chocolate pudding. Our group has bonded and all that we hoped the trip would do for our family has been done. Even Peter has decided he’s enjoying himself. We have planned a 40 kilometer day for the next day and gave Rob the alarm clock since he did so well when we needed him that first morning. We know there is a store in Point du Bois and, from here on, are planning our trip around getting to that store mid day when we know for sure it will be open. We really want that ice cream! Rob’s alarm clock responsibility didn’t go too well and we all slept right through it. The plan was to be up by 6, but I got up first and had no idea what time it was so I just made my coffee. 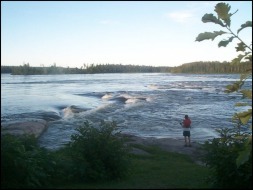 We want to make it past Lamprey Falls today, at least 40 kms., and we have some rapids to conquer along the way. All this, is, of course, to get to that ice cream – which Rob has fantasized into being a Baskin Robins where he can get 80 free spoonful tastes of ice cream. Imagination and conversation abound when you spend so many hours just sitting in a canoe and paddling (it’s just great!). It was an excellent morning anyway, in an excellent camp spot and I was sad to leave. Never the less we did get a fairly early start of around 9 AM. We ate breakfast, packed everything up and then went for one last swim – paddling for at least a little while wet. Extreme heat has been with us for the entire trip so far. We have all changed color significantly but managed to avoid any bad burns with sunscreen, hats and T-shirts draped over whatever is feeling the sun at the moment. Today we are experiencing a slight head wind and not as much current as we’d hoped for. I’ll bet we’d notice it more if we were paddling against it. Rob spent the day navigating through islands and calling out Barrie’s kilometers one by one. They seemed to be passing ever so slowly. We took a brief break, and as was usual, passed around the map. We determined that Rob had made a slight navigation error. We were still on course, but we were 5 kms further than we thought. What a feeling that was! We found a C on the map that we hoped stood for camping (and not current) at a point 27 kms from our last camp spot and decided to head there for a lunch break. When we got there we were disappointed to find 5 motor boats parked there. Tired and unsure of the next spot, I asked if they minded if we joined them. Not only didn’t they mind, they gave us cold drinks (beer again for Ray and I – wow! ), some fish from their fish fry and we chatted the afternoon break away. They were 3 generations of Americans who had been coming to Pine Island Lodge for the past 10 years, and had the carvings in the cook shelter to prove it. After a swim and some lunch we left this spot at about 5 PM. Time had become meaningless to us. We ate when we were hungry and our only goal was to get off the water before darkness struck, and that could be quite late this time of year. We were headed for Halliday Rapids. These would be the first of many rapids that we would shoot, and we didn’t know what to expect. Halliday Rapids turned out to be just a little bit of fun, fast water with no danger at all, even this year with the extremely high water levels. Next stop was Lamprey Falls and then look for a home. As we neared Lamprey Falls, we could hear some rushing water but there was no portage marker in site. We approached cautiously to the right of the falls, thinking that if no portage was evident we would shoot the falls. It was late, we were tired and the thought of a portage before nightfall wasn’t appealing. Meters before the falls we spotted the portage and put in. We were glad we did for several reasons. Lamprey Falls wasn’t shootable – we would surely have been wet on this one. The other reason was the great camp spot found at the top of the portage. There were two picnic tables, a fire pit, a cook shelter and a BIFFY – what a luxury! Not only had we found home for the night, but we’d conquered portage number five in the process. 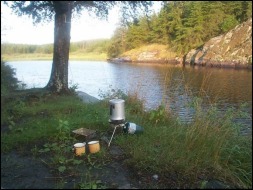 Rob began setting up tents, Peter went fishing in the falls, I cooked those Chinese noodles again and Ray, um – he seemed busy? Due to depleted trail snacks by this time, I made bannock mixed with GORP for the next days snacks. Delicious! Anyway, the well oiled machine that our family had begun made a home in moments. We had travelled 37 kilometers – our longest day yet – and were only 10 kms from the ice cream store (Point du Bois). What can be said about Day 5 but Adventure! I can honestly say that I would not have taken Peter, my 11 year old son, over the waters of Day 5 had I known what we faced. Having done it, we are stronger and have more experience for it, but there were risks today I was not prepared for. We started out with a pretty good brisk paddle 10 kms to Point du Bois and the first of the days Hydro Dams. Rob navigated very carefully to keep us to “Barrie’s line” though the islands. It may not have been necessary but we didn’t want to take any chance s with a Hydro Dam in front of us. As we neared Point we didn’t see any obvious portage so we just put into shore a safe distance from the dam. The first person we saw worked for Hydro and we asked him the best way around the dam. He pointed out a truck and told us the keys were under the dash. We thought this was a hydro truck, but we later found out this was “Gord’s” personal vehicle. Thanks so much Gord! This was Point du Bois. What a cool experience that town was! Hydro workers offered help and advice as we moved our gear with the truck. The store owner was friendly, helpful and stocked cold beer alongside the ice cream. Dawn Fiko, of Pinawa, left work to come out to see us at the beach when she heard there were “Pinawa people” portaging through. 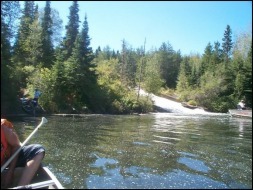 The Point du Bois portage took a couple of hours, but not because of the hard work – more because of all the visiting. The one piece of advice given us in Point that we chose to ignore was about Eight Foot Falls. Normally these falls are no problem for canoers, but this year the water was very high and we were advised to continue our portage past these falls. After all, we had Gord’s truck. Barrie’s line on our map showed us shooting them, and by now we’d experienced a few rapids and were rather enjoying them, so we put in at the beach in Point and proceeded to the falls. Rob and I heeded Barrie’s line and stayed to the far right. The eddies and currents were strong, but we paddled hard and came through with an exhilarating ride, just in time to turn and see Ray and Peter in the middle of the falls. Ray was no longer in the canoe, but rather grabbing onto it from inside the churning water with Peter paddling his heart out. Rob wanted to head in and get them but I stopped him. Not only would have been very difficult to paddle up that current, I didn’t want us entering danger unless it became absolutely necessary. 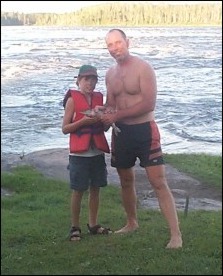 Instead we stayed helplessly, but safely, out of the rapids and shouted encouragement to Peter. As soon as he got close enough we threw him a rope and paddled both canoes to safety, where Ray climbed back in and bailed out the canoe that was half full of water. What had happened was the canoe got caught in an eddy that swung them around 360 degrees and, as the canoe began to swamp Ray jumped out to save it. It worked, but left poor Peter to fend for the both of them. Peter did exactly what he needed to do, and put more effort into those few minutes than he’d done the whole previous 5 days, but when he got to safety he put his head down and sobbed. It was heart breaking for me. We still had more rapids and then the Slave Falls Hydro Dam to get around before night fall. The rapids further down the river proved fast but safe. The Slave Falls portage proved to be a frightening experience. As we neared the dam, we saw danger signs and overhead cones warning us that boating beyond this point was strictly prohibited, yet Barry’s line showed us proceeding a full 1 1/2 kilometers past this point. The line went right past the dam and open spillway. Surely this couldn’t be right? We stopped many times and checked and rechecked the map. There were no other portages, and no other obvious way over the dam. Barrie had seen us safely though everything else. We had no choice, but as we paddled under those cones and past the spillway, my heart raced. Peter had enough excitement that day to last him his lifetime, and yet we fed him more . Halfway across the spillway Rob and I spotted the portage marker, well hidden and half-fallen. I have never felt so happy to reach a shore. 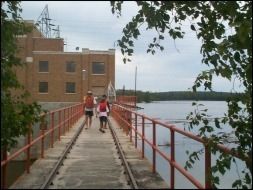 We spent an hour or so exploring this dam, which is unmanned and reached only by railway, then we aced the portage with one trip. The adventure wasn’t over yet. Due to the swamping, our only clock, an electronic one, wasn’t functional any more. It was cloudy for the first time of this trip, and we couldn’t tell whether it was night falling or thick cloud cover. Rain began to fall and we had Scott’s Rapids ahead. We had been warned about these rapids and didn’t want to encounter them in the dark, but there was nowhere to camp. A few kilometers down the river we found a tiny island we feared would disappear completely if the Slave Falls Dam were opened any more, and we pulled in to spend the night here. The sleeping bags were wet. While packed well in plastic, five days of portaging had ripped holes in the plastic and the duct tape used to repair the holes had leaked. We started a fire and dried out all but one of them. Ray was to have a cold wet night. No one wanted dinner, but we had six beer from the store in Point, which we consumed quietly around the fire. We are 26 kilometers from home and will be there tomorrow. Home today! Peter suggested leaving all our gear behind on the island. He can’t imagine ever needing any of it again. We have a 26 kilometer paddle and are unconcerned what time we get home to our beds and our pillows. We packed up quickly, the kids denied breakfast in their hurry. On the river we felt a brisk head wind as we cautiously approached Scott’s Rapids. Stay to the left, we were told. We listened and shot through them with no real trouble. To the right the rapids churned viciously well into the middle of Numao Lake. As we turned the corner into Numao Lake, though, the brisk head wind turned into gale force winds. Rob and I paddled as hard as we could, the front of our canoes bouncing so high over the waves I could barely reach the water. Sometimes we moved backwards. We watched Ray and Peter suffer even more than us. We managed to get to an island where we spent four hours waiting for the wind to die down. It never did, and this island was not suitable for camping. We sat on this rock and we ate what trail snacks were left, and we sat, and we waited… All the while, all we could think of was getting home. Finally we put the canoes back into that gale force wind and battled across Numao Lake to Sturgeon Falls. We hoped that this effort would put us into Nutimik Lake and more favorable wind conditions. 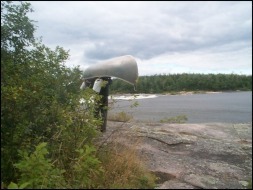 After walking the Sturgeon Falls portage and having a look at the three-foot waves and even stronger wind over Nutimik, Ray and I realized we weren’t getting home that day. We also couldn’t stay here as there was nowhere to camp. We fiercely debated our options as only families can do. Rob wanted to go home, and, quite frankly, was strong enough to do it. Unfortunately he was the only one in the group that could. 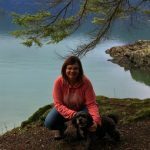 I wanted to crawl along the shore and find Nutimik campground on the other side of the lake somewhere. As we debated, the wind abated slightly and we decided to go for Barrier Bay and the campground there for the night. We portaged in one crossing and lunched into Nutimik. As soon as we got away from shore the wind picked up again. We battled for 1 1/2 hours to cross that lake. I watched Peter bouncing up and down in their canoe. Rarely could he reach the water and his effort was useless. Ray was paddling alone. In our canoe, Rob advised me to take small strokes in this wind. 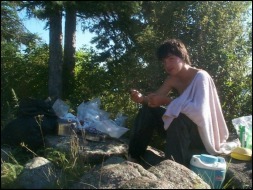 He had just spent 2 weeks paddling Lake of the Woods with a Camp Stephens group and had battled worse than this. When we reached Barrier Bay it was evening and we were exhausted. This would be our last night, as we are expected at home tomorrow and must make it, but we are discouraged to be here. We have only covered 11 kilometers today. Discouraged or not, we enjoyed the hot showers here and collected enough firewood for a long, last evening fire. We were out of propane for our stove so we cooked rice over the fire. The kids discovered that rice with margarine tastes just like spaghetti (remember that imagination?). We actually really enjoyed that last evening more than we thought we could. Expected home today, and only 15 kilometers from home, we woke early and packed. Coffee and porridge needed to be cooked over the fire without any propane, but we cleaned that up quickly. We woke to NO WIND and sunny skies and were hopeful it would be a quick trip home. No sooner had we pushed off for home but the wind began to pick up and gain force. What may have seemed like a nice stiff breeze on land became almost insurmountable on the lake. Rob and I practiced the short strokes and found islands and bays to hide out in. While hard paddling, we made good time and found it frustrating to continually stop and wait for the other canoe. We did stop, though, on a great sandy beach at Pinewood Lodge in Dorothy Lake not long after battling Otter Falls. We had boated this area for years and never seen Otter Falls as treacherous, but by now both canoes sailed through without trouble. We had a lot of experience under us by now. 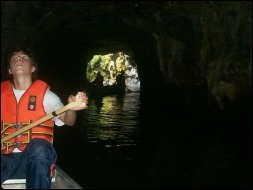 We had a picture of our last day, paddling along and counting down the kilometers from Barrie’s map. It turned out not to be quite so ideal, as the wind made it impossible for us to call out to Ray and Peter. The wind made the count down painfully slow. We waited once more at the mouth to Sharky’s Channel. We knew when we got through there we would see Pinawa, and then our home. The rapids in Sharky’s tossed us and turned us, but we battled through. Our canoe was literally spit out at the other end, and a quick paddle on Rob’s part threw us a full 180 degrees and pointed us to home. A few minutes later, we rounded the bay into “our” canoe dock and landed our canoe – home at last. Ray and Peter followed us a few minutes later. Portage number 10, the last one, was up a trail that leads to our back yard. We made the trip in one passing and dropped our gear in our own backyard. Someone had cut our grass and our neighbors had left a stew warming in our oven. It never felt so good to be home. We had enjoyed an adventure of a lifetime for a family the age and size we are. While I don’t recommend this trip to everyone, the bonding that occurred in those seven days will endure. 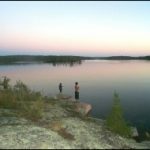 The Whiteshell is a beautiful region, with endless surprises, all manner of terrain but well-marked portages and campsites to facilitate this type of trip. 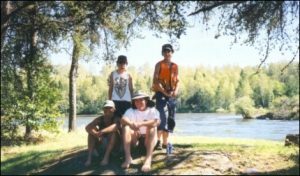 We traveled 181 kilometres over lakes, rivers and 10 portages and spent 7 nights in the wilderness.